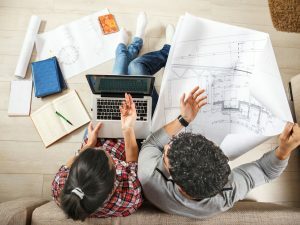 Building your own home can be complicated as it involves many parties from builders, contractors, lenders, solicitors, accountants, quantity surveyors and the council. When so many people are involved in a process, often there is communication breakdown which leads to things going wrong. Here are some key areas to consider before applying for a construction loan. Set your expectations – Remember that each lender will have different processes. As a result, if you are applying to more than one lender, you will have to look closely at what documents are needed to apply for each lender. If handling several documents seems confusing, it is best to look at hiring a mortgage broker, who will fix issues as and when they arise. How do loans work? – When you apply for a loan, you will have to hand the lender a copy of the building/ tender plans, and they will give these plans to their valuer for an estimate on completion. Once the loan is approved, you will then be issued a loan offer. When your builder requires payments from the bank, your builder will have to hand in additional documents, like council approved plans and schedules, etc. Changes to the building contract – Changes in the building contract price can be hassle some as the lender will have to reassess the loan. Therefore, it is important to hand in the final building contract to the lender and avoid making any changes. Legal assistance – For large construction loans, it is best to speak to a law firm that handles construction services. Your designated lawyer will then be able to read your loan contract an highlight any issues that need to be changed or clarified. Written by Lyle Charles. Mr. Charles is a certified expert witness for the construction industry, specializing in both commercial and residential projects. If you need a steel fabrication expert, he will get you the best.